With over 25 years of video game development and hits that include everything from Auto Club Revolution to NASCAR, U.K. studio Eutechnyx has switched its focus away from consoles, setting its sights squarely on mobile’s free-to-play market. Inside Mobile Apps sat down with Eutechnyx CEO Darren Jobling to get his thoughts on the move to F2P, industry trends, and Eutechnyx’s plans for 2014, including details on their latest game, ACR Drift. Inside Mobile Apps: Eutechnyx has been so successful on consoles and PC in the past, why did you feel like now was the right time to shift the company’s focus to mobile? Darren Jobling: It’s a changing world out there. Back in 2010, we started off raising some money from private ventures in Amsterdam, specifically to tackle the free-to-play market. We’ve been known for our racing and driving games, but we wanted to have some variation, and we have some very passionate people who had some great ideas for mobile, so that’s how we got started. We setup a mobile division in our company and got some really, really motivated people to start working on our mobile products. IMA: Are you still going to make console games, or is your focus now entirely on mobile? DJ: We have NASCAR 14 going out in time for Daytona this February, and that’s PlayStation 3, Xbox 360, and PC. So we don’t see the console market going away, but instead of doing multiple console games, we’re really just concentrating on NASCAR on the console front, and then moving the other teams to mobile. IMA: What’s been the biggest learning curve going from console games to the mobile market? DJ: Somebody famously said, free isn’t cheap enough, and that about sums it up. It’s a very different market, a different skill set, and a different reward structure in terms of how quickly you want to get people on board. With a console game, somebody invested $50 in a product, so they’re quite motivated to learn everything about the game to understand it, but on mobile, if you don’t reward somebody straightaway, they’re gone and they’ve already moved on to something else. It’s a tough market, but it’s a really interesting market. IMA: Is ACR Drift the next game you guys have coming out for mobile? DJ: Yes. We have Auto Club Revolution, which is our free-to-play PC game, and we saw a huge opportunity to bring all of those licenses across to mobile. 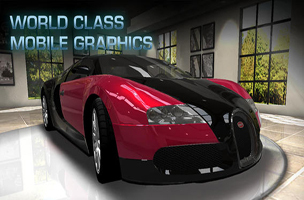 We have over 60 of the world’s biggest car manufacturers like BMW and Mercedes, and we wanted to bring these cars to a game where the control method was tailored specifically for mobile. We teamed up with Crooz, and these guys are one of the big players in the Japanese and Korean market, so they’re bringing their free-to-play and mobile expertise, we’re bring the driving expertise, and what we’ve come up with is ACR Drift. The game is currently in beta on iOS in Australia, and it’s been the number one, best-selling racing game. We’re looking at Q1 to release it world-wide. It’s really going to get people to sit up and take notice to what we’re doing. It’s a really cool, really simple game with incredible graphics. IMA: What do racing fans want in a mobile game that’s different from their desires when playing on a console? DJ: I think everybody wants the realistic physics and great visuals, and now the bar has been set so high in racing and driving games, you need to have that to even begin to compete in the genre. You need great graphics, great physics, and great licenses, and that’s just your starting point. What we’ve done from there is taken some great locations from around the world, places like Moscow, Hong Kong, and Los Angeles, and we’ve created a game that combines some of that street racing excitement with that ease of accessibility. It’s a quick race/reward mechanic, so you don’t have to spend hours figuring out how to drive as you bounce off the barriers. You just get straight into it and get racing, then later on, it gets much harder. So it’s easy to get on board, but tough to master.